Note: if you use Mac OS, Preview.app may not print the PDF file well. Use Adobe or a Windows PC. There are many great books about Warren Buffett. I read The Intelligent Investor (I.I. )and Buffett: The Making of an American Capitalist when I started learning about stocks. I.I. is THE book on value investing and investing in general. The latter book, a biography, gave me an overall idea about his life upto 1995. Later, I read Essays of Warren Buffett: Lessons for Corporate America. This book re-organizes Buffett’s annual letters based on topics, unlike the original letters were written, of course, in chronological order. I found this book much easier to read than individual letters. However, once you know much about Buffett, you probably have lots of questions to ask him for opinions and advice. Like many problems in life, you are not alone. Every year, lots of lucky people get the chance to ask him and his partner Charlie Munger many simple or, more often, sophisticated questions, at the annual meeting or school visits. The problem is, how do we know what he replied? No recordings are allowed in such events; journalists reports are scarce and never detailed. It has Buffett’s answers to 463 questions covering 17 categories from “Investing approaches” to “Personal”. It is a huge document with 175, 164 words. Dickens’ A Tale of Two Cities only has 135, 420 words. To make reading easier, I spent some time and converted the webpage to eBook format. I fixed some errors from converting as well as some typo from original document. If you find more, feel free to let me know. I enjoyed reading this FAQ even more than the Essays of Warren Buffett. First, it’s more vivid and full of impromptu humor. Unlike the formal well-thought writings in the annual letters, these FAQs are real face-to-face conversations. I am amazed by how Buffett organizes his thoughts, ideas and background info in no time to answer challenging questions, by how he make fun of himself, Charlie, the audience and the financial industry etc. in a witty yet polite manner. These Q&A sessions are full of laughter. We have the honor system — shareholders have the honor, and the executives have the system. Second, it covers much wider topics. There are topics that cannot be covered in Buffett’s letters but only in conversations. Some cannot because it’s not so appropriate in formal writing, such as criticizing other people. Some are what Buffett doesn’t bother or would not think of to talk unless someone asks, such as questions on specific industry or business. Some would not fit in the business setting of Berkshire annual letters, such as opinions on worldly issues, career and life advices. You have certain things you want to achieve, but if you don’t have the love and respect of people, you are always a failure. Third, it comes with a personal touch. In conversations, with his story-telling skill, Buffett shares many personal stories that would not be covered in his business letters nor by biography authors, such as his Saturday visit to GEICO in 1951 without appointment. He met Lorimer Davidson, Assistant to the President, who was later to become CEO. Davidson spent 4 hours showing this stranger young student around GEICO and told him about all the GEICO business (Q#222). Most people in this room and most college students I talk to will have plenty of money, but some will have few friends. Fourth, lots of interactions between him and Charlie. Buffett and Munger are life time partners. They complement each other, which means they have differences. Buffett is a democrat, while Munger is a republican. Buffett believes the best days of America are yet to come, while Munger thinks America is near its peak glory. This Q&A includes lots of interactions between this pair of greatest minds, funny or insightful. Charlie and I have been partners in some way since 1959. We worked together in a grocery store and both came to the conclusion that we don’t like hard work. We have never had an argument. You just have to learn how to calibrate his answers. If you ask Charlie something and he says “no,” then we put all of our money in it. If he says “that’s the stupidest thing I’ve ever heard,” then we make a more moderate investment. If you calibrate his answers and then you’ll get a lot of wisdom. Hope you enjoy this book as much as I do. Happy reading and investing! 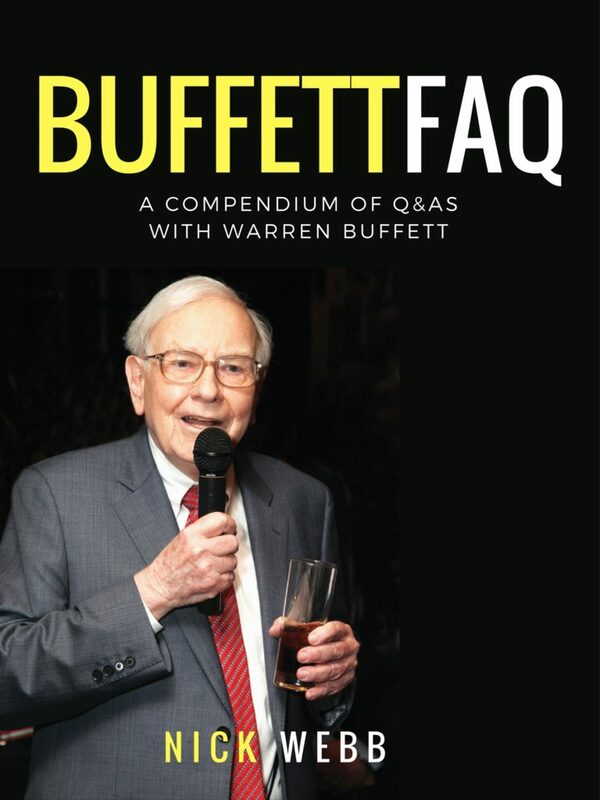 Go back to links to download Buffett FAQ the eBook.